Where is the best fishing? - Lake Houston Fishing! Post subject: Where is the best fishing? Some friends and I are planning to go fishing on Saturday(08-25-07). We aren't sure where the best place to fish this time of year would be on the Lake. 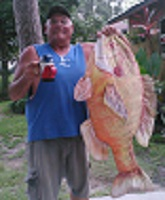 I know that there is always good fishing in Luces Bayou. If anyone could help me out with some information it would be very helpful. Thanks in advance for all of your help. Post subject: Fish this sat. Crappie fishing is tough with the lake temp. so high.I have still managed to get a few but ya gotta work for em. I think the east fork may be worth a try just hadnt made the run in a few days, think the bass fishing or catfishing would be more productive at this time. Thanks for the input I appreciate it, I used to fish the lake at least 3 times a week when I was younger then my grandfather passed away and it just wasnt the same, we used to run trot lines and bring catfish home by the boat load full. LHA, catfish dreams is in the right area, if the water isn't running very much from the rains since its deeper in the outer bends than the Bayou. Crappie are holding in the deeper thermal zones in 12-15 foot hitting minnows (or even shad if you have a cast net) better than dark colored jigs. If you're coming out of B.J. 's Marina, make a "B" line across the channel to the island and start on that north shore of that island and head west along the bank. This area has lots of structure, averages 10-18 foot fairly close to the bank and fish it slow. Once you start hitting the shallower water close to the shore, motor north in the fork until you see the highline wire running from the Commons to Kingwood. Fish this east bank since it is similar to the island across from B.J.s, approx. same depth and lots of structure. Double rig tightlines or with corks at different depths until you can get a pattern on them. Also, check the depth finder often since this will give you a heads up on the depth. If this pattern don't work, go to HEB or Krogers, I think they have Telapia on sale right now. Good luck and "stay out of my holes". If I have to go and buy fish my wifeis gonna kick my a$$. Thank you for the information. Are the catfish biting on shrimp, livers, hearts, etc. or are they primarily biting on shad? If I was going to fish for catfish, I would try around the railroad tressel and use shad for bait. I've caught a lot of catfish there in the summertime in years past when I was fishing for crappie. The crappie haven't bit under the tressel very well this summer, but I bet you could catch some cats there. Any of the above baits will work, but shad is best. Cool. Thanks again for the input I will try and put it to good use. Man it is a scorcher out there today, I went to the boat storage on my lunch break to charge my batteries and good god is it hot. Saturday is supposed to be worse.